Herefordshire Light Infantry Museum01432 359917work MuseumThe Herefordshire Light Infantry Museum tells the story of the Herefordshire Light Infantry in campaigns such as Galipoli, Egypt and Palestine. 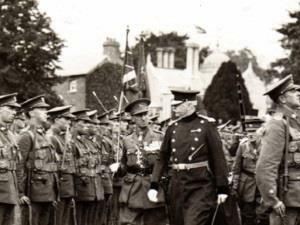 The Herefordshire Light Infantry Museum also describes their inception as the Herefordshire Rifle Volunteers raised in 1860, and in modern times, their involvement in the arrest of Admiral Doenitz at the end of World War 2. It is the 107 year story of a Volunteer Regiment from a small English County. It is a success story. A story of bravery, determination, and devotion to duty, of sadness of comrades lost, but also that of a job well done. It is a tale that ought to be known more widely. On the A438, leaving the Hereford ring road towards Ledbury, turn onto the B4224 to Fownhope & Newent (Eign Road). Take the first turning right and turn right or left at the t-junction into Harold Street.